Update [November 02, 2017]: Well, Samsung has made the Android 8.0 Oreo beta official now. 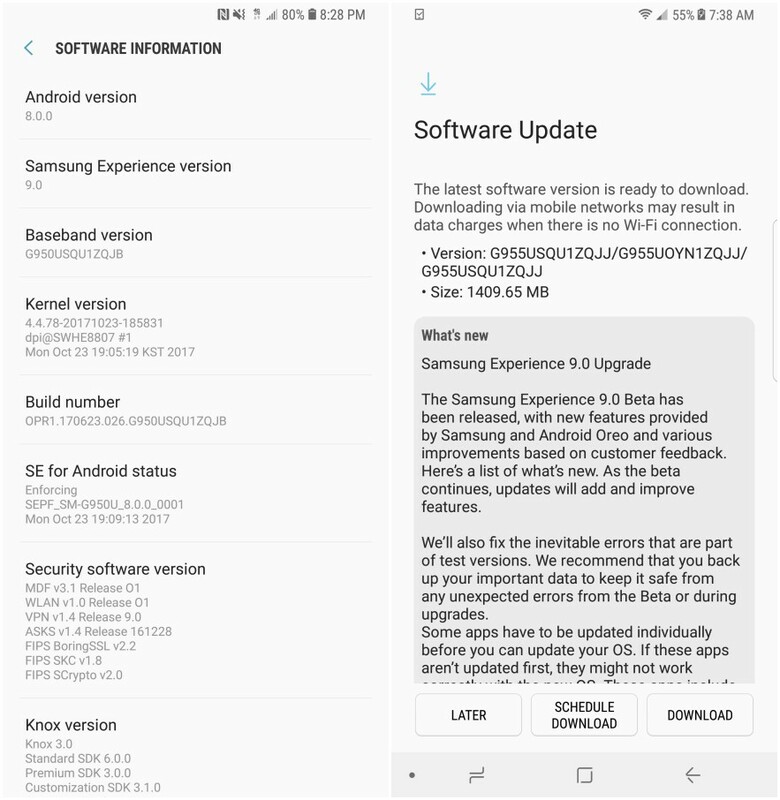 The Oreo builds from Samsung would run their Samsung Experience 9.0 UI atop it, and Samsung so much wants you to know this, that they have decided call their Oreo beta update a Samsung Experience 9.0 update. And there’s yet more fun to this: They have even dubbed Oreo as Android 9.0 in their tags section of the announcement page (yep, weird). Clearly, someone at Samsung didn’t realize 9.0 is the version of their Samsung Experience UI only, not the Android Oreo. Anyway, Samsung has made it clear that the beta Android 8.0 update would be available in the US, UK and Korea, though for certain category of users in each region. In the US, the unlocked sets that come as model no. SM-G950U1/SM-G955U1 are eligible for the 8.0 beta, in addition to carrier locked sets at T-Mobile and Sprint. In Korea, carrier locked sets at KT, SKT and LG U+ are eligible. while in the UK, only open market devices (read: unlocked) sets are eligible. The OTA will available starting today, of course, and once Samsung has had enough feedback and insights from the test build, they will fix bugs and prepare the stable version of the Oreo update, or Samsung Experience 9.0, which shall be released as an OTA for public. We knew Samsung is going to release the Android 8.0 for Galaxy S8 and S8 Plus today, and the Korean giant has indeed gone ahead and done just that. The Oreo update for the Galaxy S8 and S8 Plus is now rolling out to users in the US, T-Mobile and Sprint. We expect the Oreo update to hit S8 users in other countries pretty soon too, starting with Korea outside the USA. The screenshot you see above is for the S8 in the left, and S8 Plus in the right. It’s clear from the image that Samsung is calling it ‘Samsung Experience 9.0’ update, which naturally also includes bump to version Android 8.0.0. Mind you, the 8.0.0 is not the latest Android version anymore, because Google gave us Android 8.1 few days ago. Given the fact that OEMs now a days like to talk about the major Android OS update too in terms of their own custom skin — Huawei and Xiaomi lead the pack in this case — it’s hardly surprising, even though pleasing at all, to see Samsung follow the suit too. If you are at T-Mobile or Sprint in the US, you might want to join the Galaxy Beta program now, as this is how you can get Oreo update on your Galaxy S8 and S8 Plus too. Follow the link below for help with S8 Oreo beta registration. When the update will hit India, UK, or Europe is not known, but we’re sure it’s not far now that first build of the Samsung Android 8.0 OTA is trickling down from Samsung servers. Hopefully, the firmware too becomes available soon of the Oreo update, which BTW is identified as software version G950USQU1ZQJB (S8) and G955USQU1ZQJJ (S8 Plus). It’s weird that we are seeing two different versions already. If you ask us, we believe QJB is the test build that leaked out in screenshots on the web earlier, while QJJ is the real deal. Check out our Samsung Oreo update article for all news related to Samsung 8.0 and Experience 9.0 update for other devices like Galaxy S7, S7 Edge, Note 8, and devices in Galaxy A, Galaxy J, and Galaxy C series.